Barry Mitchell is back with another magic creativity workshop filmed live at Kidabra International Family Entertainers Conference. 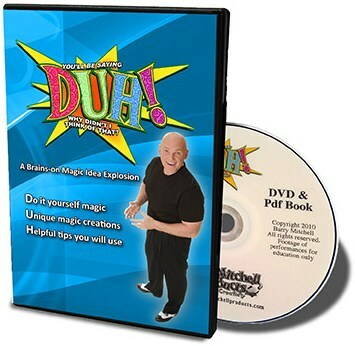 Barry's book on creativity, "The Magic of Thinking Creatively", and his DVD by the same name, filmed at Kidabra 2002, have been huge hits. This new workshop follows his "Dollar Store Creativity" articles, written for Kidabra magazine, and brings them to life. You'll also get the audio performance CDs for King Midas, Super Sleuth, and Bad Book Worms, three of Barry's most popular effects. Get it ALL at a great price!